One way in which the view of the UK Government is expressed is through decisions on Consents and Wayleaves for new or existing overhead lines. We give some examples where EMFs have featured here. Government policy on EMF issues for power lines is now set out in a 2009 Written Ministerial Statement and fleshed out in two 2011 Codes of Practice. The National Policy Statement EN-5 established these as the correct basis for deciding on consent for new power lines. Power lines of 132kV and above in the UK count as "major infrastructure", and consent for them is given by the Infrastructure Planning Commission (IPC). Parliament approve a suite of National Policy Statements (NPSs) to give directions to the IPC on policy, so that when the IPC comes to decide applications, it decides them on the basis of policies established by Parliament. 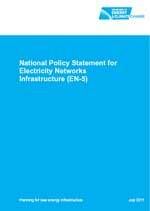 NPS EN-5 is the National Policy Statement for Electricity Networks Infrastructure and is therefore the NPS that guides the IPC on policy relating to EMFs. NPS EN-5 endorses the policies of compliance with the relevant exposure guidelines in the UK - ICNIRP in the terms of the EU Recommendation - and of optimum phasing. It refers to the two Codes of Practice for the necessary practical details to apply these policies. "2.10.6 The balance of scientific evidence over several decades of research has not proven a causal link between EMFs and cancer or any other disease. The HPA CRCE keeps under review emerging scientific research and/or studies that may link EMF exposure with various health problems and provides advice to the Department of Health on the possible need for introducing further precautionary measures. 2.10.7 The Department of Health’s Medicines and Healthcare Products Regulatory Agency (MHRA) does not consider that transmission line EMFs constitute a significant hazard to the operation of pacemakers. 2.10.8 There is little evidence that exposure of crops, farm animals or natural ecosystems to transmission line EMFs has any agriculturally significant consequences. " "Before granting consent to an overhead line application, the IPC should satisfy itself that the proposal is in accordance with the guidelines, considering the evidence provided by the applicant and any other relevant evidence." "Where the applicant cannot demonstrate that the line will be compliant with the Electricity Safety, Quality and Continuity Regulations 2002, with the exposure guidelines as specified in the Code of Practice on compliance, and with the policy on phasing as specified in the Code of Practice on optimal phasing then the IPC should not grant consent." "It is not the Government’s policy that power lines should be undergrounded solely for the purpose of reducing exposure to EMFs. Although there may be circumstances where the costs of undergrounding are justified for a particular development, this is unlikely to be on the basis of EMF exposure alone, for which there are likely to be more cost-efficient mitigation measures." "However, where it can be shown that the line will comply with the current public exposure guidelines and the policy on phasing, no further mitigation should be necessary." National Grid had applied for Development Consent for a new power line to enable the connection of the proposed new Hinkley Point C nuclear power station. The application was considered by the Planning Inspectorate who made a recommendation to the Secretary of State, and on 19 Jan 2016, the Secretary of State accepted that recommendation and granted Development Consent (subject to various conditions). In the course of considering the application, EMFs were looked at in depth. National Grid provided information in its Environmental Statement, the Inspectorate asked several Written Questions, and EMFs were a major part of one of the issue Specific Hearings. 5.7.79 Subject to the recommendations made in this and other sections of the report, the Panel is satisfied that the proposed development would meet the aims of policy advice on health, well-being, and EMFs set out in national policy statements, the NPPF and local policy. This is so both in terms of individual and cumulative effects, and during construction, operation and decommissioning. This was the first major application where EMFs were a particular issue to have been considered since the UK policy system of National Policy Statements and Codes of Practice was created. It seems to confirm that, provided the Codes of Practice are complied with and the right evidence produced of this, EMFs will not be considered a reason for refusing Consent or for requiring modifications – the combinaton of exposure limits and specified precautionary measures is considered to give the right level of protection for the public.. Prior to the introduction of the National Policy Statements and Codes of Practice, the system was still based on compliance with exposure limits, but this had to be justified in each application. Click to drop down the following box to see some examples. "The Secretary of State notes that the scientific evidence has now been reviewed by many national and international bodies and the NRPB's view remains that it does not consider that the results of published epidemiological studies provide a basis for quantitative restrictions in respect of exposure of the public to EMFs from overhead lines or other electricity supply apparatus." "I would therefore agree that the section of line that oversails Woodlands complies with the above-mentioned professional guidelines [ie ICNIRP] on this matter.The possible health effects that might arise from persons being exposed to the EMFs emitted from this section of line do not therefore provide sufficient grounds for refusing the Necessary Wayleave to keep this section of line in situ." In January 2010 the Scottish Government gave consent to the proposed new power lines from Beauly to Denny. EMFs had featured heavily in the Inquiry but no EMF conditions were imposed. See full details of the decision here. Proposals to build new power lines sometimes arouse strong feelings and opposition. See the links section of this site for some of the groups opposed to new power lines.